The Chapel was filled with students and community members on Friday, Mar. 23, when Regent N.O.W. hosted the worship band Upper Room for a special two-hour event. And special, it was. I arrived an hour early to watch the ticket line extend past the Chapel steps to the middle of the student walkways. When I made it inside, I sat in one of the back rows and watched as seats filled up and friends chatted. Lyrics from “For the Cross” by Bethel Music. When the pastor of Upper Room took the mic to introduce the band, he told us to “approach the Lord rightly [because] we bring thanksgiving to Him and enter His courts with praise.” He called for us to have a unified hunger for the presence of God and to set a table of thanksgiving for Him as the Guest of Honor. He said that we don’t come to worship God to get something from Him but to give ourselves in praise to Him, and by doing so, He honors our faithfulness. It didn’t take long for people to forget about the person beside them and to focus their attention on Jesus Christ. We sang songs of gratefulness for what He has done for us. We sang songs that reminded us of 2 Chronicles 20:22 and 2 Corinthians 10:4 because praise is how we fight our battles. We all have days when strife, drudgery, and heartache try their best to make us forget in our higher hope. By focusing on our thankfulness to God, our minds were taken off the problems of our world and our burdens were lifted. By the end of the night, students were praying for students. Some had been bothered by mental illnesses, some had felt the weight of leadership positions. Some cried, some shouted. 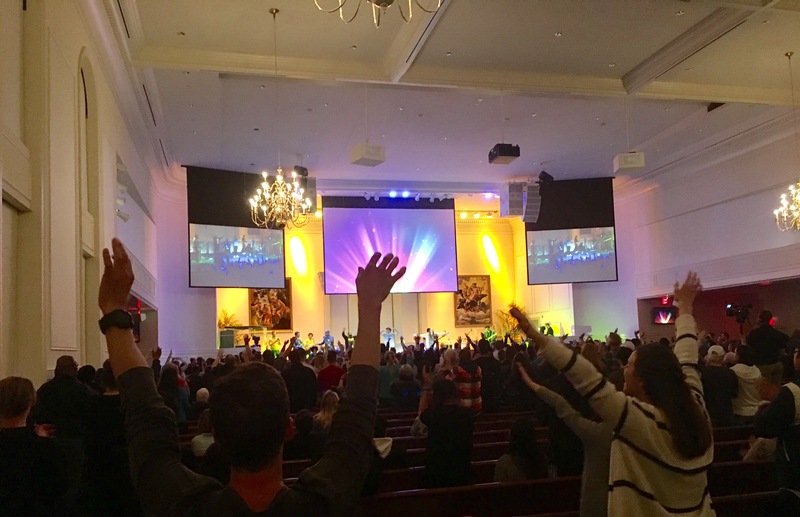 One thing was evident – the presence of God was there among a unified student body who were being the hands and feet of Jesus to fellow classmates. It was beautiful to witness that kind of love. It was beautiful to be a part of it. If you haven’t attended a Regent N.O.W. event… what are you waiting for?! Regent N.O.W. can be found on Facebook, Instagram, and Snapchat where updates on future events will be posted. You can register for our next Night of Worship with Phil Wickham on Apr. 21 here. Come join us and see that the Lord is good!